Seahorses for the Novice | Are Seahorses "Ok" for the Beginner? Seahorses for the Novice | Are Seahorses “Ok” for the Beginner? In my experience, what is required to keep seahorses successfully is not so much a great deal of expertise, but rather a great deal of devotion and dedication. Anyone with a passion for seahorses who is willing to do their homework and approaches seahorse keeping with the right attitude can eventually do well. (1) Do your homework ahead of time! Seahorses must never be an impulse purchase! Learn all you can about the care and requirements before you take the plunge. Get a couple of good seahorse guide books and brush up them. Join one or more Internet discussion forums devoted to seahorses and pester them mercilessly asking every question that comes into your head. One book I would recommend is Seahorses: Complete Pet Owner's Manual by Frank Indiviglio, published by Barron's in 2001. It is a worthwhile investment and a good place to start providing you bear in mind that it was written before captive-bred seahorses became widely available so the information it contains applies primarily to wild-caught specimens. It is quite affordable and is available for under $7. But the best book I think is How to care for your Seahorses in the Marine Aquarium, subtitled "A Stable Environment For your Seahorse Stable" by Tracy Warland (2001). 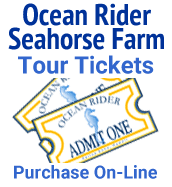 It deals with captive-bred seahorses and is also quite inexpensive. The discussion group I like for beginners is the Ocean Rider Club on Yahoo. Is a very friendly, informative, free help forum composed entirely of seahorse keepers. (2) Avoid delicate wild caught seahorses and stick with hardy, captive-bred seahorses that are well adapted for aquarium conditions and easy to feed. (3) Start small but think big. Limit yourself to a single pair of seahorses at first and keep them in a spacious aquarium that is much more than adequate for their needs. This will provide you with a comfortable margin for error while you gain experience. (4) Find a mentor with loads of seahorse savvy to help you learn the ropes. This can be someone from a local aquarium society who is knowledgeable about seahorses, an aquarium service guy in your area, or perhaps a seahorse fanatic from your local fish store or one of their staff you know well and trust. For starters, the Ocean Rider tech support staff can serve as your mentor from afar. They can guide you every step of the way through the process of setting up an appropriate aquarium for seahorses from picking out the tank, decorating it, cycling the aquarium, selecting suitable specimens, acclimating the new arrivals, and feeding and maintenance. Five years ago, during the Dark Ages of seahorse keeping before culture seahorses where available, when fragile wild-caught seahorses were the only option, I would have had to tell you there was no way an inexperienced hobbyist should attempt to keep seahorses. The delicate wild seahorses were totally unsuitable for beginners — far too difficult to feed and far too sensitive to aquarium conditions. But captive-bred seahorses are much different from wild-caught specimens and much easier to keep and breed. The recent appearance of hardy farm-raised seahorses that are pre-conditioned for the captive environment and pre-trained to eat frozen foods means that, for the first time, these fabulous fish are no more difficult to feed and maintain in the aquarium than the average angelfish, and are far easier to breed. For the first time, modern aquaculture techniques, successful breeding and rearing protocols for Hippocampines, and effective grow-out technology and maturation methods have brought the Holy Grail of aquarium fish within easy reach of the average hobbyist. And that changes everything. In terms of their hardiness, ease of maintenance, disease resistance, longevity, adaptability, suitability for the captive environment, willingness to breed in the aquarium, genetic diversity, vigor, friendliness and sociability, coloration, and especially their feeding habits, captive-bred seahorses put wild seahorses to shame. No contest! Generations of selective breeding have transformed cultured seahorses into far different animals — a whole new breed — than wild seahorses. Compared to their wild-caught cousins, the captive-bred-and-raised seahorses are far more fun, much easier to keep and more convenient to care for, and generally more attractive specimens as well. In short, the advantages of farm-raised, captive-bred seahorses over wild-caught specimens are many, obvious, and compelling. But to me, the most striking difference between cultured seahorses and wild specimens has always been the increased hardiness of the former. Captive-bred seahorses simply enjoy a huge advantage over their wild-caught brethren in terms of their health, disease resistance, and conditioning, and that naturally translates to greater longevity in the aquarium. To understand why they are so much hardier and healthier, we must examine how cultured seahorses and seahorses captured from the wild are handled before they reach the hobbyist. It is largely a matter of stress. In a nutshell, captive-bred-and-raised seahorses are not stressed by aquarium life and are not abused en route to the aquarist, and that makes all the difference in the world in terms of their fitness and lifespans in captivity. When you place an order for farm-raised seahorses, they are then delivered overnight directly to your door from Hawaii's state-of-the art aquaculture facility, and thus reach the consumer well fed and in optimum condition. They arrive disease-free and relatively unstressed, at the peak of their health and coloration. This gives them a huge headstart over wild-caught seahorses, which are often beat up during capture (specimens taken in trawls, for example, often suffer considerable wear and tear during the collection process) and mishandled at various stops along the way to your local fish store (LFS). By the time they finally arrive at your local dealers, wild-caught seahorses may already have spent a long time in the collector's holding tanks followed by an indefinite stay at a wholesaler and a high-risk respite at your local retailers, and have been exposed to all manner of pathogens and parasites at every stop along the way. Due to their need for live foods, they are very likely to have gone unfed during this entire period, and they may have become malnourished by the time they reach your neighborhood fish store. And because they were taken from coastal waters, wild seahorses are frequently infested with a variety of pests and parasites ranging from sea lice (Argulus sp.) to nematodes, parasitic copepods and hydroids. Upon arrival, they will need to be quarantined for a period of several weeks, since they may also be carrying disease pathogens such as fungus, Vibrio, or deadly Glugea. Captive-raised, high-health seahorses pose no such problems. The greater adaptability of captive-bred and reared seahorses is another big plus. Cultured seahorses have now achieved a high level of domestication. They are pre-adapted to aquarium conditions and pre-trained to eat easily provided frozen foods. Because they are raised at much greater population densities than seahorses experience in nature, captive-bred specimens are accustomed to living in close quarters and withstand crowding much better than wild-caught ‘horses. Consequently, farm-raised seahorses have little difficulty adjusting to life in a captive environment. By contrast, field studies show that, in the wild, seahorses have a distribution pattern that can best be described as patchy, meaning they are few and far between, and that a female typically enjoys a home territory of up to 100 square meters. It stands to reason that wild-caught seahorses may have a more difficult time acclimating to life in captivity than farm-raised ponies that are literally born and bred for life in the aquarium. And that means that wild-caught seahorses will be under more stress in captivity, at least initially. The bottom line is that captive bred and raised seahorses are simply hardier, more disease resistant, easier to maintain and longer lived in captivity than their wild-caught counterparts. They reach the hobbyist well fed, in peak condition, and already accustomed to aquarium life and frozen foods. On the other hand, wild-caught seahorses typically arrive at your local fish store in poor shape, suffering from near starvation and the trauma of capture. Mishandling combined with malnutrition stresses these animals and impairs their immune systems, making them prone to disease. So if you stick with hardy, adaptable, easy-to-feed captive-bred seahorses, half the battle is already won. But I would not advise inexperienced aquarists to attempt to keep wild seahorses under any circumstances.